The Smartwatches have reached the market and lot of people is excited about the idea of having the last Apple Watch or Moto 360 in their wrist, but is it actually a new useful technology? In mi opinion it depents on the apps we could create for them. 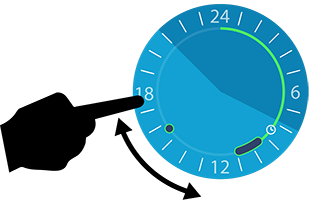 Actually this device presents itselft as a small, but not unacurate, screen that connects continously with your watch and gives you an easy access to some apps. Having a time line, why not having some usefull information about your travel time to destination? With options in your smartphone it would be possible to chose your transport and Google Maps will give you a route planing. 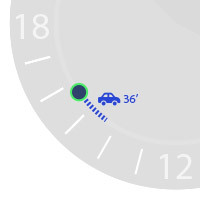 Easily you would be able to launch your Goole Maps GPS from your watch, easy and quick. 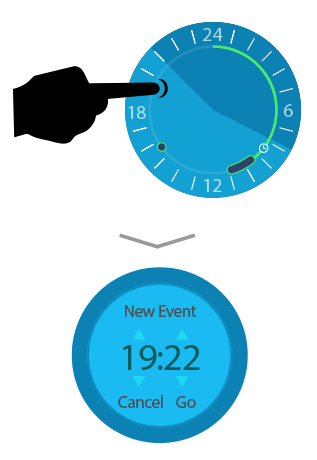 The border of the watch can be easily use to get input from the user. Creating time line decision could be a kids task if we incorporate a few cues in the process. Touch to create could be a very direct way of creating meeting points in your agenda. Additional screens will do the extra info getting process preferably with voice commands and dictation. Deleting or editing task could be completed by clicking the circle points in the timeline.